The invention concerns excipients or combinations thereof suitable for preparing an oral formulation containing a pharmaceutical agent. More particularly, the invention is directed to stable, efficacious and bioavailable oral pharmaceutical formulations comprising paclitaxel, derivatives of paclitaxel and pharmaceutically acceptable salts thereof. The formulations of the invention increase bioavailability of paclitaxel when dissolved in the gastrointestinal system. The formulations of the invention are useful for administering paclitaxel, its derivatives, or pharmaceutically acceptable salts of such derivatives to patients in need thereof. The formulations of the invention are particularly suitable for oral administration to mammals including humans. Pharmaceuticals are rarely distributed or administered as pure compounds because of problems with, among others, stability, solubility, and bioavailability of the pharmaceutical itself (i.e., the active). In most cases, pharmaceuticals are administered in a pharmaceutical formulation comprising the active, and other components, such as excipients, binders, diluents, and other delivery vehicles, carriers or systems. It is well documented that physical and chemical properties, such as stability, solubility, dissolution, permeability, and partitioning of most pharmaceuticals are directly related to the medium in which they are administered. And, in turn, the physical and chemical properties of drug-in-formulation mixtures affect the pharmacological and pharmacokinetic properties, such as absorption, bioavailability, metabolic profile, toxicity, and potency. Such effects are caused by interactions between the formulation's components and the pharmaceutical and/or interactions between the components themselves. Other properties influenced by the formulation in which a pharmaceutical is administered include mechanical properties, such as compressibility, compactability, and flow characteristics and sensory properties, such as taste, smell and color. Thus, discovery of pharmaceutical formulations that optimize bioavailability and duration of action of the pharmaceutical and minimize undesirable properties is an important part of pharmaceutical development and research. For a general review of the subject of formulations see Howard,  Introduction to Pharmaceutical Dosage Forms, Lea & Febiger, Philadelphia Pa., 4th ed., 1985; Remington: the Science and Practice of Pharmacy, Alfonso R. Gennaro ed., Mack Publishing Co. Easton, Pa., 19th ed., 1995, Chapter 83. Paclitaxel is presently available in the United States only as a non-aqueous sub-optimal formulation concentrate for intravenous injection. An intravenous dosage regimen of 135 mg/m 2 paclitaxel is recommended for previously untreated patients with carcinoma of the ovary, given every three weeks. Similar dosage regimens are recommend for other carcinomas. Paclitaxel is practically insoluble in water. The commercially-available paclitaxel formulation (Bristol-Myers Squibb) comprises 6 mg/ml of paclitaxel dissolved in Cremophor® EL (castor oil, polyoxyethylated castor oil) and dehydrated ethanol (50% v/v). Similar formulations are sold by other manufacturers, for example, IVAX Co. Before intravenous injection, the commercial dose must be diluted to a final concentration of 0.3 to 1.2 mg/ml prior to injection. Recommended diluents are 0.9% aqueous sodium chloride, 5% aqueous dextrose, or 0.9% sodium chloride 5% dextrose aqueous solution, or 5% dextrose in Ringer's injection (The Physician's Desk Reference, 54th edition, 881-887, Medical Economics Company (2000); Goldspiel 1994 Ann. Pharmacotherapy 28:S23-26, both of which are incorporated herein by reference). There is currently no commercially available oral formulation of paclitaxel. In addition, paclitaxel acts a substrate of P-glycoprotein. As a result, the oral bioavailability of paclitaxel is quite limited. Sparreboom et al. Proc. Natl. Acad. Sci., vol. 94, pp 2031-2035, 1997. There is a need, therefor, for formulations comprising paclitaxel, derivatives, and pharmaceutically acceptable salts thereof that can deliver therapeutically effective amounts of pactitaxel and derivatives thereof in a stable oral formulation with an increased bioavailability. Further, the invention also encompasses methods of orally delivering paclitaxel to a mammal which comprises administering paclitaxel adjunctively with one or more inhibitors of P-glycoprotein. In other words, before, during, or after the administration of paclitaxel or a pharmaceutically acceptable derivative thereof, an inhibitor of P-glycoprotein is also administered such that the uptake of paclitaxel by the gastrointestinal system is improved. In a preferred embodiment, the P-glycoprotein inhibitor is administered as part of the oral formulation. In another embodiment, the paclitaxel and the p-glycoprotein inhibitor are administered separately but adjunctively, that is concurrently or sequentially. In another embodiment, the invention encompasses methods of orally delivering paclitaxel to a mammal which comprises administering paclitaxel adjunctively with one or more inhibitors of P-glycoprotein wherein the P-glycoprotein is administered in an amount less than previously found effective. wherein, each occurrence of R is independently H, (C 1-C6)alkyl, aryl, C(O)(C1-C6)alkyl, or C(O)aryl. Preferably, (C1-C6)alkyl is methyl and aryl is phenyl. Such derivatives are well known in the art. 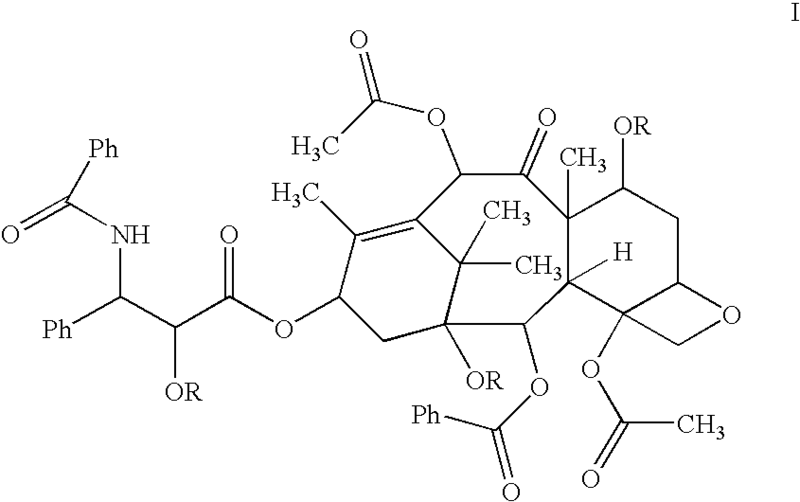 For example, paclitaxel derivatives encompassed by formula I are disclosed in U.S. Pat. Nos. 5,399,726; 5,654,447; 6,066,747; 5,338,872; 6,107,332; 5,703,117; 5,714,512; 5,580,899; 6,118,011; 5,470,866; 5,319,112; and 6,136,961. As used herein, the term “alkyl group” means a saturated, monovalent, unbranched or branched hydrocarbon chain. Examples of alkyl groups include, but are not limited to, (C 1-C25)alkyl groups, such as methyl, ethyl, propyl, isopropyl, 2-methyl-1-propyl, 2-methyl-2-propyl, 2-methyl-1-butyl, 3-methyl-1-butyl, 2-methyl-3-butyl, 2,2-dimethyl-1-proyl, 2-methyl-1-pentyl, 3-methyl-1-pentyl, 4-methyl-1-pentyl, 2-methyl-2-pentyl, 3-methyl-2-pentyl, 4-methyl-2-pentyl, 2,2-dimethyl-1-butyl, 3,3-dimethyl-1-butyl, 2-ethyl-1-butyl, butyl, isobutyl, t-butyl, pentyl, isopentyl, neopentyl, hexyl, and longer alkyl groups, such as heptyl, and octyl, nonyl, decyl, undecyl, dodecyl, tridecyl, tetradecyl, pentadecyl, hexadecyl, heptadecyl, octadecyl, nonadecyl, icosanyl, henicosanyl, docosanyl, tricosanyl, tetracosanyl, and pentacosanyl. An alkyl group can be unsubstituted or substituted with one or more suitable substituents. An “alkenyl group” means a monovalent, unbranched or branched hydrocarbon chain having one or more double bonds therein. The double bond of an alkenyl group can be unconjugated or conjugated to another unsaturated group. Suitable alkenyl groups include, but are not limited to (C 2-C25)alkenyl groups, such as vinyl, allyl, butenyl, pentenyl, hexenyl, butadienyl, pentadienyl, hexadienyl, 2-ethylhexyl, 2-propyl-2-butenyl, 4-(2-methyl-3-butene)-pentenyl, nonenyl, decenyl, undecenyl, dodecenyl, tridecenyl, tetradecenyl, pentadecenyl, hexadecenyl, heptadecenyl, octadecenyl, nonadecenyl, icosanenyl, henicosanenyl, docosanenyl, tricosanenyl, tetracosanenyl, and pentacosanenyl. An alkenyl group can be unsubstituted or substituted with one or more suitable substituents. An “alkynyl group” means monovalent, unbranched or branched hydrocarbon chain having one or more triple bonds therein. The triple bond of an alkynyl group can be unconjugated or conjugated to another unsaturated group. Suitable alkynyl groups include, but are not limited to, (C 2-C25)alkynyl groups, such as ethynyl, propynyl, butynyl, pentynyl, hexynyl, methylpropynyl, 4-methyl-1-butynyl, 4-propyl-2-pentynyl, 4-butyl-2-hexynyl, nonynyl, decynyl, undecynyl, dodecynyl, tridecynyl, tetradecynyl, pentadecynyl, hexadecenyl, heptadecynyl, octadecynyl, nonadecynyl, icosanynyl, henicosanynyl, docosanynyl, tricosanynyl, tetracosanynyl, and pentacosanynyl. An alkynyl group can be unsubstituted or substituted with one or more suitable substituents. An “aryl group” means a monocyclic or polycyclic-aromatic ring comprising carbon and hydrogen atoms. Examples of suitable aryl groups include, but are not limited to, phenyl, tolyl, anthacenyl, fluorenyl, indenyl, azulenyl, and naphthyl, as well as benzo-fused carbocyclic moieties such as 5,6,7,8-tetrahydronaphthyl. An aryl group can be unsubstituted or substituted with one or more suitable substituents. Preferably, the aryl group is a monocyclic ring, wherein the ring comprises 6 carbon atoms, referred to herein as “(C 6)aryl”. A “cycloalkyl group” means a monocyclic or polycyclic saturated ring comprising carbon and hydrogen atoms and having no carbon-carbon multiple bonds. Examples of cycloalkyl groups include, but are not limited to, (C 3-C7)cycloalkyl groups, such as cyclopropyl, cyclobutyl, cyclopentyl, cyclohexyl, and cycloheptyl, and saturated cyclic and bicyclic terpenes. A cycloalkyl group can be unsubstituted or substituted by one or more suitable substituents. Preferably, the cycloalkyl group is a monocyclic ring or bicyclic ring. The term “alkoxy group” means an —O-alkyl group, wherein alkyl is as defined above. An alkoxy group can be unsubstituted or substituted with one or more suitable substituents. Preferably, the alkyl chain of an alkoxy group is from 1 to 25 carbon atoms in length, referred to herein as “—(C 1-C25)alkoxy”. The term “aryloxy group” means an —O-aryl group, wherein aryl is as defined above. An aryloxy group can be unsubstituted or substituted with one or more suitable substituents. Preferably, the aryl ring of an aryloxy group is a monocyclic ring, wherein the ring comprises 6 carbon atoms, referred to herein as “(C 6)aryloxy”. The term “benzyl” means —CH 2-phenyl. The term “phenyl” means —C 6H5. A phenyl group can be unsubstituted or substituted with one or more suitable substituents. As used herein, a “suitable substituent” means a group that does not nullify the synthetic or pharmaceutical utility of the active or the paclitaxel solubilizer of the invention. Examples of suitable substituents include, but are not limited to: (C 1-C8)alkyl; (C1-C8)alkenyl; (C1-C8)alkynyl; (C6)aryl; (C2-C5)heteroaryl; (C3-C7)cycloalkyl; (C1-C8)alkoxy; (C6)aryloxy; CN; OH; oxo; halo, CO2H; NH2; NH((C1-C8)alkyl); N((C1-C8)alkyl)2; NH((C6)aryl); N((C6)aryl)2; CHO; CO((C1-C8)alkyl); CO((C6)aryl); CO2((C1-C8)alkyl); and CO2((C6)aryl). One of skill in art can readily choose a suitable substituent based on the stability and pharmacological and synthetic activity of the paclitaxel solubilizer of the invention. The phrase “pharmaceutically acceptable salt(s)”, as used herein, means those salts of paclitaxel derivatives that retain the biological effectiveness and properties of the free acids or free bases and that are not otherwise unacceptable for pharmaceutical use. Pharmaceutically acceptable salts of paclitaxel derivatives include salts of acidic or basic groups which may be present in the paclitaxel derivatives. Derivatives of paclitaxel that are basic in nature are capable of forming a wide variety of salts with various inorganic and organic acids. The acids that may be used to prepare pharmaceutically acceptable acid addition salts of such basic compounds are those that form non-toxic acid addition salts, i.e., salts containing pharmacologically acceptable anions, such as chloride, bromide, iodide, nitrate, sulfate, bisulfate, phosphate, acid phosphate, isonicotinate, acetate, lactate, salicylate, citrate, acid citrate, tartrate, pantothenate, bitartrate, ascorbate, succinate, maleate, gentisinate, fumarate, gluconate, glucaronate, saccharate, formate, benzoate, glutamate, methanesulfonate, ethanesulfonate, benzenesulfonate, p-toluenesulfonate and pamoate (i.e., 1,1′-methylene-bis-(2-hydroxy-3-naphthoate)) salts. Derivatives of paclitaxel that include an amino moiety can also form pharmaceutically acceptable salts with various amino acids, in addition to the acids mentioned above. Derivatives of paclitaxel that are acidic in nature are capable of forming a wide variety of salts with various inorganic and organic bases. Suitable base salts are formed from bases that donate cations to form non-toxic salts, suitable cations include, but are not limited to, sodium, aluminum, calcium, lithium, magnesium, potassium, zinc and diethanolamine salts. For a review on pharmaceutically acceptable salts see Berge et al.,  J Pharm. Sci., 66, 1-19 (1977), incorporated herein by reference. The formulations of the invention are useful for the oral delivery of paclitaxel, derivatives or pharmaceutically acceptable salts thereof to mammals in need thereof. The formulations of the invention are useful for treating or preventing mammalian cancers and other medical conditions treatable by paclitaxel. By “treating” it is meant that the formulations are administered to inhibit or reduce the rate of cancer-cell proliferation in an effort to induce partial or total remission, for example, inhibiting cell division by promoting microtubule formation. For instance, the formulations of the invention are useful for treating solid tumors and blood-born tumors. Examples of cancers treatable or preventable by formulations of the invention include, but are not limited to, cancers of the lymph node; breast; cervix; uterus; gastrointestinal tract; lung; ovary; prostate; mouth; brain; head; neck; throat; testes; kidney; pancreas; bone; spleen; liver; bladder; skin; larynx; nasal passages; AIDS-related cancers, and cancers of the blood. The formulations can be used alone or in combination with other chemotherapeutics. The mode, dosage, and schedule of administration of paclitaxel, derivatives, and pharmaceutically acceptable salts thereof in human cancer patients have been extensively studied, see, e.g., 1989  Ann. Int. Med., 11:273-279, incorporated herein by reference. The doses can readily be determined by in vitro tests and/or in vivo tests. Doses and dose frequency will vary with the disease and severity thereof, patient age, height and can be monitored or adjusted by the clinician. The amount of paclitaxel to be administered is in accordance with the recommended doses found in the Physicians Desk Reference adjusted for the bioavailability by oral route. The formulations of the invention can be prepared by combining the actives, oils, solvents, and surfactants of the invention, and other components using well-known pharmaceutical-formulation methods. Formulation of liquid dosage forms, is described in  Remington: the Science and Practice of Pharmacy, Alfonso R. Gennaro ed., Mack Publishing Co. Easton, Pa., 19th ed., 1995, Chapters 87 and 88; incorporated herein by reference. A comprehensive discussion on formulating solid forms, such as powders, tablets, pills, and capsules is presented in Remington: the Science and Practice of Pharmacy, Alfonso R. Gennaro ed., Mack Publishing Co. Easton, Pa., 19th ed., 1995, Chapters 91 and 92, incorporated herein by reference. A comprehensive discussion on formulating solutions, emulsions, and suspensions is presented in Remington: the Science and Practice of Pharmacy, Alfonso R. Gennaro ed., Mack Publishing Co. Easton, Pa., 19th ed., 1995, Chapter 86, incorporated herein by reference. Formulations of the invention in the form of gels and semisolids containing the active can be prepared according to well known methods. For instance, by mixing the active with the paclitaxel solubilizers of the invention, and any additional components or excipients in a standard V-blender. Preferably, solids, liquid concentrates, semisolids, gels, suspensions, and emulsions, contain about 25 milligrams to about 2500 milligrams of active, more preferably, about 50 milligrams to about 500 milligrams. The formulations of the invention can include additional pharmaceutically acceptable excipients. Preferred additional excipients do not affect the stability or oral bioavailability of the formulations. Examples of suitable excipients, such as binders and fillers are listed in  Remington: the Science and Practice of Pharmacy, 18th Edition, ed. Alfonso Gennaro, Mack Publishing Co. Easton, Pa., 1995 and Handbook of Pharmaceutical Excipients, 3rd Edition, ed. Arthur H. Kibbe, American Pharmaceutical Association, Washington D.C. 2000. The present formulations can include additional actives and thus can serve as base formulation for combination therapy. Such additional actives can be included and distributed in the formulation itself or administered adjunctively with the formulation. Additional actives can be any other cancer and cancer-related pharmaceuticals, such as cisplatin, carboplatin, epirubicin, leuprolide, bicalutamide, goserelin implant, irinotecan, gemcitabine, and sargramostim; cardiovascular drugs; such as amlodipine besylate, enalapril maleate, losartan potassium lisinopril, irbesartan, nifedipine, diltiazem, clopidogrel, digoxin, abciximab, furosemide, amiodarone, beraprost, and tocopheryl; anti-infective agents, such as amoxicillin, clavulanate, ciprofloxacin, azithromycin, itraconazole, acyclovir fluconazole, terbinafine, erythromycin, and sulfisoxazole acetyl; psychotherapeutic agents, such as fluoxetine, paroxetine, sertaline, vanlafaxine, bupropion, olanzapine, alprazolam, methylphenidate, fluvoxamine, and ergoloid; gastrointestinal medicaments, such as omeprazole, lansoprazole, ranitidine, famotidine, ondansetron, granisetron, sulfasalazine, and infliximab; respiratory therapies, such as loratadine, fexofenadine, cetirizine, fluticasone, salmeterol xinafoate, and budesonide; cholesterol reducers, such as simvastatin, atorvastatin calcium, pravastatin, lovastatin, bezafibrate, ciprofibrate, and gemfibrozil; blood modifiers, such as epoetin alpha, enoxaparin, and antihemophilic factor; antiarthritic agents, such as celecoxib, diclofenac sodium, nabumetone, misoprostol, and rofecoxib; AIDS and AIDS-related drugs, such as larnivudine, zidovudine, indinavir, stavudine, and lamivudine; diabetes and diabetes-related therapies, such as metformin, troglitazone, and acarbose; biologicals, such as hepatitis vaccines; Hormones, such as estradiol; immunosuppressive agents, such as cyclosporine, mycophenolate mofetil, and methylprednisolone; analgesics, such as tramadol, fentanyl, metamizole, ketoprofen, morphine, lysine acetylsalicylate, ketoralac tromethamine, morphine, loxoprofen sodium, and ibuprofen; dermatological products, such as isotretinoin and clindamycin; anesthetics, such as propofol, midazolarn, and lidocaine; migraine therapies, such as sumatriptan succinate, zolmitriptan, and rizatriptan; sedatives and hypnotics, such as, zolpidem, triazolam, and hycosine butylbromide; multiple sclerosis agents, such as interferon beta-1a, interferon beta-1a, and glatiramer; osteoporosis agents, such as vitamin k 2; cystic fibrosis agents, such as dornase alpha and tobramycin; Alzheimer's disease therapies, such as dolasetron and donepezil; and imaging agents, such as iohexol, technetium Tc99m sestamibi, iomeprol, gadodiamide, ioversol, and iopromide; or pharmaceutically acceptable salts thereof. The present invention will be further understood by reference to the following non-limiting examples. The following examples are provided for illustrative purposes only and are not to be construed as limiting the invention scope of the invention in any manner. diluted in simulated gastric fluid. (b) one or more of an oil, solvent, or surfactant wherein said formulation is a non-aqueous liquid. (b) one or more of an oil, solvent, or surfactant wherein said formulation is in the form of a solid, semisolid, gel, suspension, or emulsion. 3. The pharmaceutical formulation of claim 1, wherein the formulation is adapted for delivery as a capsule, soft elastic gelatin capsule, hard gelatin capsule, caplet, aerosol, spray, solution, suspension or an emulsion. 4. The pharmaceutical formulation of claim 2, wherein the formulation is adapted for delivery as a cachet, tablet, capsule, soft elastic gelatin capsule, hard gelatin capsule, caplet, aerosol, powder or granules. 5. The pharmaceutical formulation of claim 3 or 4, wherein the formulation is adapted for delivery as a soft elastic gelatin capsule. 6. The pharmaceutical formulation of claim 3 or 4, wherein the formulation is adapted for delivery as a hard gelatin capsule. 7. The pharmaceutical formulation of claim 3 or 4, wherein the formulation is adapted for delivery as an oral solution. 8. The pharmaceutical formulation of claim 1 or 2, wherein the formulation is in single-unit-dosage form. 9. The pharmaceutical formulation of claim 1 or 2, wherein the formulation is in multi-unit-dosage form. 10. The pharmaceutical formulation of claim 1 or 2, further comprising additional excipients, flavoring agents or preservatives. 11. The pharmaceutical formulation of claim 1 or 2, comprising more than about 80 mg/mL of paclitaxel. 12. The pharmaceutical formulation of claim 11, comprising more than about 90 mg/mL of paclitaxel. 13. The pharmaceutical formulation of claim 12, comprising 100 mg/mL of paclitaxel. 14. The pharmaceutical formulation of claim 1 or 2, further comprising an organic acid selected from the group consisting of ascorbic acid, citric acid, tartaric acid, lactic acid, oxalic acid, formic acid, benzene sulphonic acid, benzoic acid, maleic acid, glutamic acid, succinic acid, aspartic acid, diatrizoic acid, acetic acid and hydrates thereof. 15. The pharmaceutical formulation of claim 14, wherein said organic acid is citric acid. 16. The pharmaceutical formulation of claim 15, wherein said citric acid is present in an amount of about 2 mg/mL. 17. The pharmaceutical formulation of claim 1 or 2, wherein said oil is Myverol 18-92, acetylated monoglycerides, Alkamuls 719, Alkamuls 620, Miglyol 812 (caprylic/capric triglyceride), canola oil, caprylic/capric triglyceride, cassia oil, castor oil, castor oil hydrogenated, palm oil--hydrogenated soybean oil, Captex 335 (C8/C10 triglycerides from coconut oil), corn glycerides, corn oil, corn oil PEG-6 esters, cottonseed oil, Captex 200 (C8/C10 diesters of propylene glycol of coconut oil), diacetylated monoglycerides, Sesame oil, Soybean oil hydrogenated, Capmul MCM (C8/C10 mono-/diglycerides from coconut oil), Benzyl Benzoate, Soybean oil, olive oil, PEG vegetable oil, Vegetable oil, Vegetable oil hydrogenated, peanut oil, mineral oil, Vegetable shortening, or mixtures thereof. 18. The pharmaceutical formulation of claim 1 or 2, wherein said solvent is ethanol, cetyl alcohol, glyceryl stearate, isopropyl alcohol, diethylamine, ethylene glycol monoethyl ether, Transcutol, benzyl alcohol, glyceryl oleate, gelucire, myristyl alcohol, diethanolamine, glycerin, glyceryl distearate, gamma cyclodextrin, gelatin, ethylene glycol, polyethylene glycol 8000, Cresol, Propylene glycol, polyethylene glycol, polyethylene glycol 1000, polyethylene glycol 1450, polyethylene glycol 1540, polyethylene glycol 200, polyethylene glycol 300, polyethylene glycol 3350, polyethylene glycol 3500, Povidone, polyethylene glycol 400, polyethylene glycol 4000, polyethylene glycol 600, polyethylene glycol 6000, Stearyl alcohol, polyethylene glycol t-dodecylthioehter, polyethylene oxide, Triacetin, Polyvinylpyridine, Polyvinyl alcohol, Polypropylene glycol, Arlacel 186 (monoolein:propylene glycol=90:10) or mixtures thereof. 19. The pharmaceutical formulation of claim 1 or 2, wherein said surfactant is Polyoxyl 20 stearate, Polyoxyl 35 castor oil, poloxamer, polyoxyethylene sorbitan monoisostearate, polyethylene glycol 40 sorbitan diisostearate, Polyoxyl 40 Hydrogenated castor oil, Polysorbate, Polysorbate 20, Polysorbate 40, Polyoxyl 60 stearate, Polysorbate 85, Polysorbate60, poloxamer 331, polyoxyethylene fatty acid esters, Polyoxyl 40 castor oil, poloxamer 188, polyoxyethylene polyoxypropylene 1800, oleic acid, Sodium desoxycholate, Sodium lauryl sulfate, Sorbitan monolaurate, Sorbitan monooleate, Sorbitan monopalmitate, Sorbitan trioleate, N-Carbamoyl methoxypolyethylene glycol 2000-1,2-distearol, myristic acid, Steareth, Stearic acid, Polyoxyl 40 stearate, Sucrose stearate, Tocopherol, polyoxyl castor oil, Triglyceri,de synthetic, Trimyristin, Tristearin, magnesium stearate, lecithin, lauryl sulfate, Vitamin E, Vitamin E TPGS, egg yolk phosphatides, docusate sodium, Polysorbate 80, dimyristoyl phosphatidylglycerol, dimyristoyl lecithin, Capryol 90 (propylene glycol monocaprylate), Capryol PGMC (propylene glycol monocaprylate), deoxycholate, cholesterol, Cremophor EL, Propylene glycol alginate, Croval A-10 (PEG 60 almond glycerides), Labrafil 1944 (oleoyl macrogol-6 glycerides), Labrafil 2125 (linoleoyl macrogol-6 glycerides), Labrasol (caprylocaproyl macrogol-8 glycerides), Lauroglycol 90 (propylene glycol monolaurate), Lauroglycol FCC (propylene glycol laurate), calcium stearate, Lecithin Centromix E, Lecithin Centrophase 152, Lecithin Centrol 3F21B, POE 26 glycerin, Olepal isosteariques (PEG-6 isostearate), Plurol diisostearique (polyglycerol-3-diisostearate), Plurol Oleique CC, POE 20 Sorbitan trioleate, Tagat TO (polyoxyethylene glycerol trioleate), and Solutol (Macrogol-15 hydroxystearate ), or mixtures thereof. 20. The pharmaceutical formulation of claim 1 or 2, comprising about 0% to about 7% by volume of an oil. 21. The pharmaceutical formulation of claim 1 or 2, comprising about 30% to about 85% by volume of a solvent. 22. The pharmaceutical formulation of claim 1 or 2, comprising about 5% to about 90% by volume of a surfactant. 23. The pharmaceutical formulation of claim 21, comprising about 30% to about 85% by volume polyethyleneglycol-400. 24. The pharmaceutical formulation of claim 23, comprising about 30% to about 35% by volume polyethyleneglycol-400. 25. The pharmaceutical formulation of claim 24, comprising about 55% to about 65% by volume polyethyleneglycol-400. 26. The pharmaceutical formulation of claim 25, comprising about 65% to about 85% by volume polyethyleneglycol-400. 27. The pharmaceutical formulation of claim 22, comprising about 5% to about 90% by volume polysorbate 80. 28. The pharmaceutical formulation of claim 27, comprising about 60% to about 90% by volume polysorbate 80. 29. The pharmaceutical formulation of claim 28, comprising about 5% to about 25% by volume polysorbate 80. 30. The pharmaceutical formulation of claim 21, comprising about 75% to about 100% by volume Transcutol. 31. The pharmaceutical formulation of claim 22, comprising about 0% to about 25% by volume PEG-Vitamin E.
32. The pharmaceutical formulation of claim 1 or 2, comprising about 1% to about 7% by volume of triacetin. 33. The pharmaceutical composition of claim 1, wherein said paclitaxel precipitates into discrete particles in gastric fluid having particle size of less than about 10 μM. 34. The pharmaceutical composition of claim 33, wherein said discrete particles have a particle size of less than about 5 μm. 35. The pharmaceutical composition of claim 34, wherein said discrete particles have a particle size of less than about 1 μm. 36. The pharmaceutical composition of claim 35, wherein said discrete particles have a particle size of less than about 600 nm. 37. The pharmaceutical formulation of claim 1 or 2, which are ethanol-free. 38. The pharmaceutical formulation of claim 1 or 2, which does not comprise cremophor. (b) one or more of an oil, solvent, or surfactant in a non-aqueous liquid, wherein said paclitaxel remains dissolved in gastric fluid for absorption or precipitates into discrete particles upon dilution with gastric fluid. (b) one or more of an oil, solvent, or surfactant in a solid, semisolid, gel, suspension, or emulsion. 41. The method of claim 39 or 40, wherein said mammal is a human. 42. The method of claim 39, wherein said discrete particles have a particle size of less than about 10 μm. 43. The method of claim 42, wherein said discrete particles have a particle size of less than about 5 μm. 44. The method of claim 43, wherein said discrete particles have a particle size of less than about 1 μm. 45. The method of claim 44, wherein said discrete particles have a particle size of less than about 600 nm. 46. A method of formulating a pharmaceutical composition comprising dissolving paclitaxel, a derivative or a pharmaceutically acceptable salt thereof in a solvent chosen from polyethylene glycol-200 (PEG-200), polyethylene glycol-300 (PEG-300), polyethylene glycol-400 (PEG-400), diethylene glycol monoethyl ether (Transcutol), or ethylene glycol monoethyl ether, prior to dilution with one or more paclitaxel-free oils, solvents, or surfactants. 47. The method of claim 46 wherein said solvent is PEG-400 or Transcutol. 48. The method of claim 47 wherein the concentration of paclitaxel after dilution with one or more paclitaxel-free oils, solvents, or surfactants is more than 80 mg/mL. 49. The method of claim 48 wherein the concentration of paclitaxel after dilution with one or more paclitaxel-free oils, solvents, or surfactants is more than 90 mg/mL. 50. The method of claim 49 wherein the concentration of paclitaxel after dilution with one or more paclitaxel-free oils, solvents, or surfactants is 100 mg/mL. 51. The method of claim 46 wherein said paclitaxel-free oils, solvents, or surfactants are triacetin, Transcutol or polysorbate 80. 52. The method of claim 46 wherein said formulation is administered before during or after the administration of a P-glycoprotein inhibitor. (b) administering a P-glycoprotein inhibitor before, during or after step (a). (ii) one or more of an oil, solvent, or surfactant in a solid, semisolid, gel, suspension, or emulsion. 56. The method of claim 54 or 55 wherein the P-glycoprotein inhibitor is Gelucire 44/14, polysorbate 20, polysorbate 40, polysorbate 60, polysorbate 80, polysorbate 85, PEG-12 stearate, PEG-20 stearate, PEG-25 stearate, PEG-30 stearate, PEG-40 stearate, PEG-45 stearate, PEG 50 stearate, PEG-100 stearate, PEG-40 hydrogenated castor oil, PEG-35 castor oil, Solutol HS, or a cyclosporin. 57. The method of claim 56 wherein the P-glycoprotein inhibitor is a cyclosporin. 58. The method of claim 57 wherein the cyclosporin is cyclosporin A.
ES2276045T3 (en) 2007-06-16 pharmaceutical compositions for inhibiting viral hepatitis C protease. ES2238050T3 (en) 2005-08-16 emulsifying drug delivery systems for lipophilic drugs extremely insoluble in water. ES2228282B1 (en) 2006-02-16 pharmaceutical composition comprising an agonist of sphingosine phosphate receptor-1. ES2096091T7 (en) 2010-03-31 New compositions based on derivatives of the class of taxanes. ES2326783T3 (en) 2009-10-20 N-staurosporine compositions spontaneously dispersible.